Bobstil Sumicad and wife, Evelyn, had high hopes for their youngest child, Marchtil. The 17-year-old, grade 11 student, had dreams. He wanted to go beyond the world of Hacienda Nene, in Barangay Bulanon, Sagay -- the sugar estate where his parents had toiled for decades. He was an artist, and loved drawing. He was also a story-teller. A few hours after Bobstil and companions in the National Federation of Sugar Workers (NFSW) put up flimsy tents for shelter at the start of their “Bungkalan,” a cultivation program to assert sugar workers’ claims on still undistributed plantations, Marchtil arrived to help his father. He promised to return home, a barangay away, on Sunday to prepare for school. After supper, Bobstil left Marchtil to do his toilet in the canefields. “I told him, ‘keep an eye out for any sign of trouble’, though we were not expecting any,” Bobstil told ABS-CBN News in an interview on October 22. Bobstil cannot say how long the barrage of gunshots lasted. Fellow survivors of the massacre say they heard shots for 15 minutes, though the Sagay City police said it lasted only five minutes. There was a brief silence, he said. Then a voice pierced the night. “Aaah, so you were trying to run away,” someone said. Then more gunshots. Minutes after the night went quiet, Bobstil crawled back to their makeshift tents. He found his son’s body 10 meters away from the red and blue tarps that served as their shelter. Bobstil makes an X with his arms, half covering his face. That was Marchtil’s position. “I saw two wounds in his neck, one in the stomach and a big hole in his back,” said Bobstil. The massacre took nine lives, including that of another minor and three women. Three other members of the NFSW survived. Danilo Cañete was lying down when the firing started. He managed to huddle behind a sack of rice and other provisions and tilling equipment and run for his life when he smelled gasoline. Rogelio Arquilo and Rene Manlangit were charging their mobile phones at the homes of acquaintances, some several hundreds of meters away. The Hacienda Nene deaths bring to 45 the number of farmers and farm workers killed in Negros island under President Rodrigo Duterte’s 2-year term, according to the Unyon ng mga Manggagawa sa Agrikultura (UMA) and the NFSW. At a press conference in Bacolod City, Manlangit said the workers decided to push through with the Bungkalan after a 2-day dialogue with the provincial agrarian reform office on October 15 to 16. Manlangit said he and other NFSW members had already discussed the cultivation program with Allan Singbenco, who had also hired many of them as seasonal labor after leasing the plantation from owner Carmen Tolentino. “We visited him two months ago and he said, ‘let me just finish harvest’ then you can plant,” Manlangit recalled Singbenco as saying. “He said, ‘once you start planting, I’ll desist from cultivation'." The union said Singbenco's lease was about to expire. Department of Agrarian Reform (DAR) Secretary John Castriciones has told dzMM that Hacienda Nene is no longer covered by the Comprehensive Agrarian Reform Program (CARP) because its ownership had been transferred through a deed of donation. This is why DAR declared its notice of CARP coverage "defective" in 2014, he added. "Ang nangyari po d'yan ay parang land occupation. Ibig sabihin, bigla nilang pinasok, nung mga magsasaka na apparently, hindi naman po sila mga beneficiary," Castriciones said, adding that "private goons" may be behind the attack. The workers rejected the DAR’s announcement, claiming to be long-time hands for the hacienda. 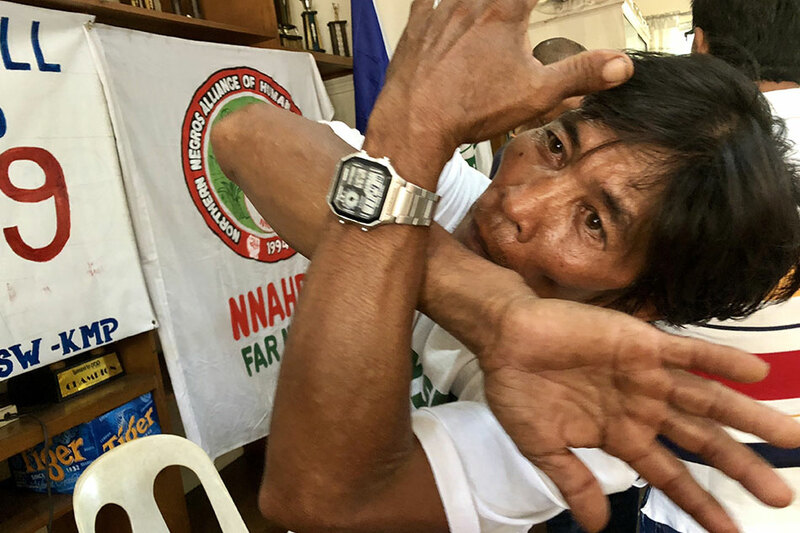 “I was earning P4, then P5, then P7 for a day’s work,” Bobstil added, describing the piece-meal system where workers divide earnings according to the number of tons of cane harvested and loaded into trucks for milling. “I later learned to drive and that was position became helper/mechanic,” he added. “Dumaan ako, tumandok. I even received social security,” Bonstil stressed. (I’m an old hand, a native.) His wife also worked as a field worker before getting a post as a domestic. Even when Bobstil was let go a few years back, turning to fishing, he would come back to work as a seasonal worker. Sometimes, when Marchtil had no school, the boy would come to help so his father could get more for a day’s work. Manlangit arrived in Hacienda Nene in 1999, after marrying the daughter of a regular farmhand. Because he was a recent hire, Manlangit did not receive social security benefits. Neither did his wife, though she had worked all her life for the family, he said. Marianito Amacan of the North Negros Alliance of Human Rights Advocates said workers consulted him on their plans. Sagay Mayor Alfredo Maranon III and his father, Negros Occidental Governor Alfredo Maranon Jr., have each offered P250,000 as reward for information leading to the identification of the killers. The mayor condemned the attack and expressed “shock” and ordered police, who estimate the number of assailants between seven to ten, to conduct an “impartial” probe. “The Palace is deeply perturbed to learn about the incident and the Philippine National Police has already been ordered to conduct a thorough and impartial investigation,” Panelo said in a statement. “Families of the victims of this extremely cruel act can count on the government that it will enforce the full wrath of the law,” Panelo said. The NFSW said months of red-tagging by Army officials in northern Negros Occidental set the tone for the attack. Brigadier General Eliezer Losañes, 303rd commanding officer of the Philippine Army, earlier claimed the “bungkalan” program aims to provide logistics for the regional branch of Asia’s longest-running leftist insurgency. 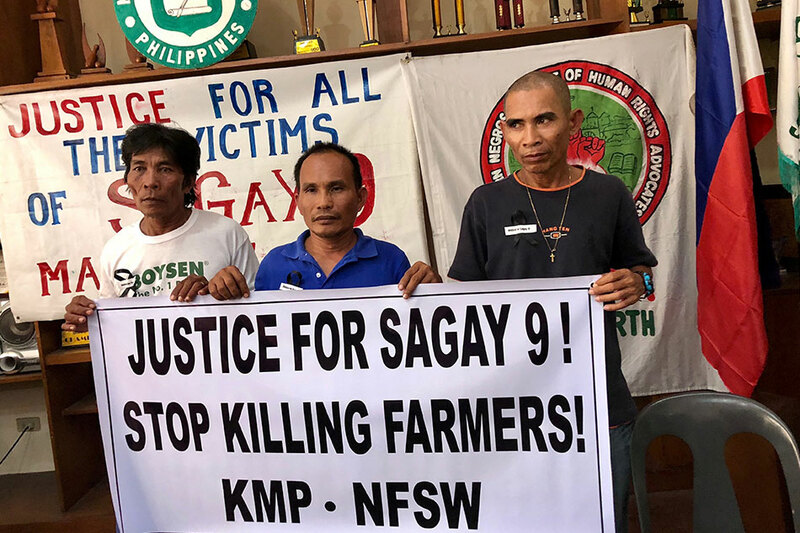 The Sagay police initially said the attack stemmed from “a land conflict”. They recovered around a dozen spent ammunition from long firearms and several more used in .45-caliber pistols. It claimed one of the dead men had a home-made .38-caliber revolver, adding that they had found a used shell of that caliber. But the police admitted that all indications pointed to a sudden attack of overwhelming force. Panelo then said government investigation appeared to point to the NPA as the perpetrators behind the massacre. Bobstil said it was too dark to see the attackers. But he shook his head at the new accusation. “I see no reason for the NPA to attack us,” he told ABS-CBN News. He said the police made him and other survivors take paraffin tests. “Of course, we agreed to do it. We have nothing to hide. We had no guns,” Manlanngit said. Amacan, the human rights worker, broke into tears when he heard the new claim. “A wife of one of the slain was crying, asking if we could ask help from the NPA,” he said.